My grandfather David Schulman was born on January 31, 1921 in Harlem New York. Little did he know that he would grow up to have a loving wife of over fifty years, three beautiful daughters, five wonderful grandchildren, and that he would also hang out of a B29 bomber plane and be held by his legs. Pretty amazing! 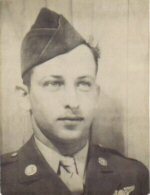 David Schulman was twenty-one years of age when he entered the air core during World War II. He was stationed in Guam and flew 30 combat missions over Japan. He had many different jobs in the war. He was a radio operator, a mechanic, and a medic to name a few. As a medic he would tell his fellow crew members of his B29 bomber, “Don’t get hurt or you’ll be stuck with me!” My grandfather’s crew flew in the longest mission of World War II, a mission of twenty-three hours. He shared a story with me about the time that the bomb bay doors partially closed on to a bomb. This caused the bomb to bounced on to a shelf like structure. The navigator, Joe Callaghan held his legs while his arms and torso dangled out of the plane. Because of his curious and mechanical nature he learned from a fight engineer how to open the doors in case there was ever a need for the crew to bail out of the plane. My grandfather David Schulman and his crew received several medals for their bravery. Included among them are, The Air Medal With Two Oak Leaf Clusters, and The Distinguish Flying Cross. He earned the nickname Dauntless Dave. After the war he thought meat cutters were making the big bucks so he took that line of work and stayed a meat cutter until he retired in 1984. David Schulman currently resides in Arizona and is still funny, sharp, caring and loving. David Schulman is my hero because he took part in many heroic efforts during the war, but more important, he is a wonderful grandfather. He always puts his family first and always shows that he worries and cares about our family. When I visit him and my grandma, we have lots of fun. He takes us around town and shows us grandkids off to all his friends at the bank; and of course our grandpa David taught my sister and I how to play poker. He taught us so well that we beat him almost ever round. Jordan Ozaki, David's granddaughter wrote this bio for an English assignment in school. David Schulman took his final flight on 12 May 2008. No other details are available at this time.